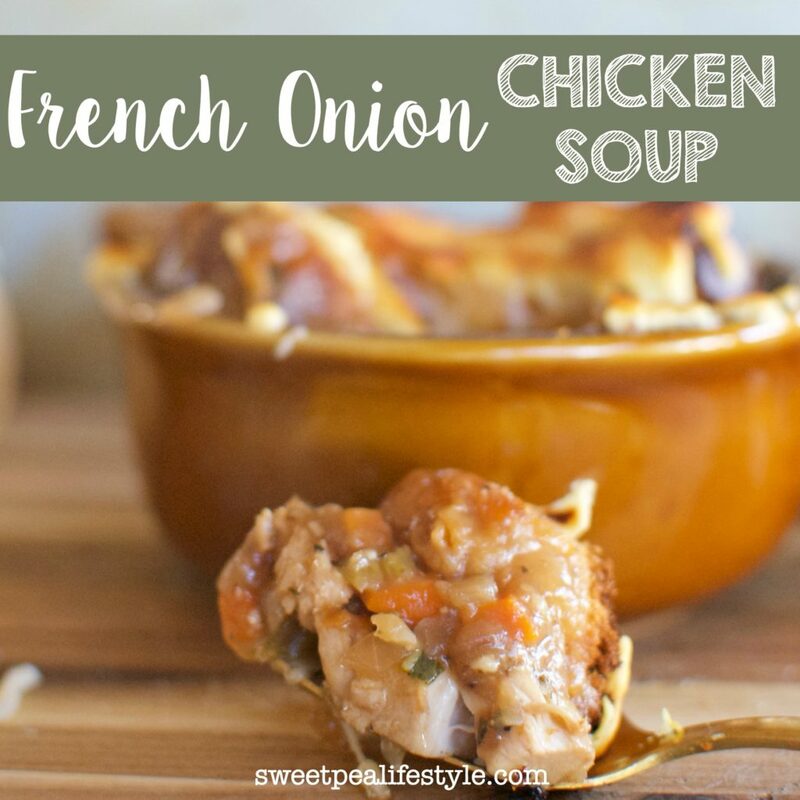 French Onion Chicken Soup is the best of both worlds! Gooey cheese and crispy croutons top a hearty, filling chicken soup. Well, winter decided to show it’s face this week! And nothing says cold wintry evenings like a pot of soup simmering on the stovetop. Chicken soup is a staple, and nothing helps with flu season more. I have two “foods” that if they are on the menu, I’m ordering them. 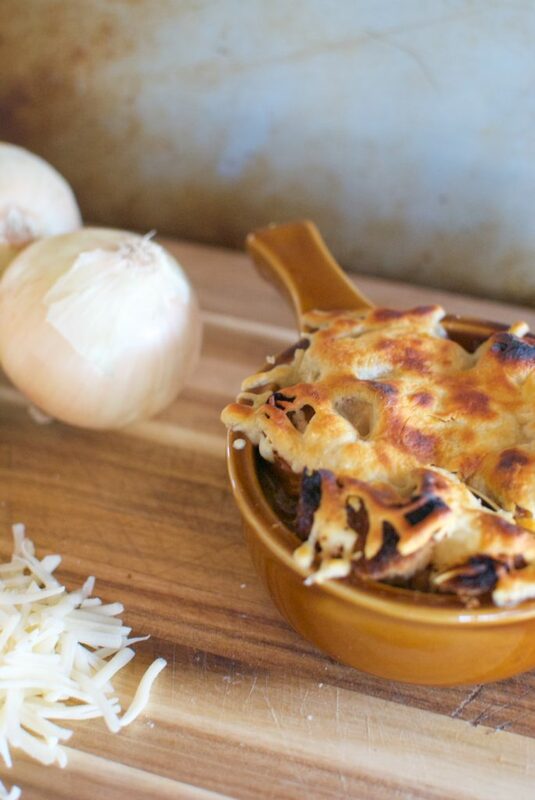 While this doesn’t combine the two — it does take my favorite onion soup, and give it a more hearty consistency. 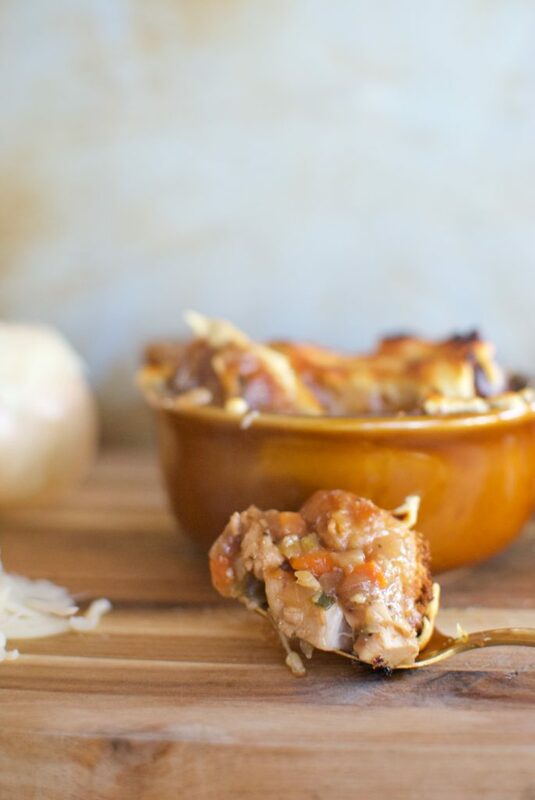 Filled with chicken, carrots, celery, onions, and garlic this is sure to bring a whole new meaning to comfort food. It’s like eating the bread bowl on TOP of your soup, covered in cheese. YUM! Begin by melting your butter over medium heat in large dutch oven. Add sliced onions once butter begins to bubble, and cook until caramelized. This takes a while — depending on your stovetop, up to twenty minutes. Once onions are caramelized, add red wine into pot and turn heat up to medium high. Reduce by half. Once wine is reduced by half, add in carrots, celery, and garlic and saute until tender — maybe 10 minutes — over medium heat. Pour in thyme, bay leaves, beef stock, and chicken. Simmer over low heat for half an hour. You could also pour all this into a crock pot and cook on low for a few hours. 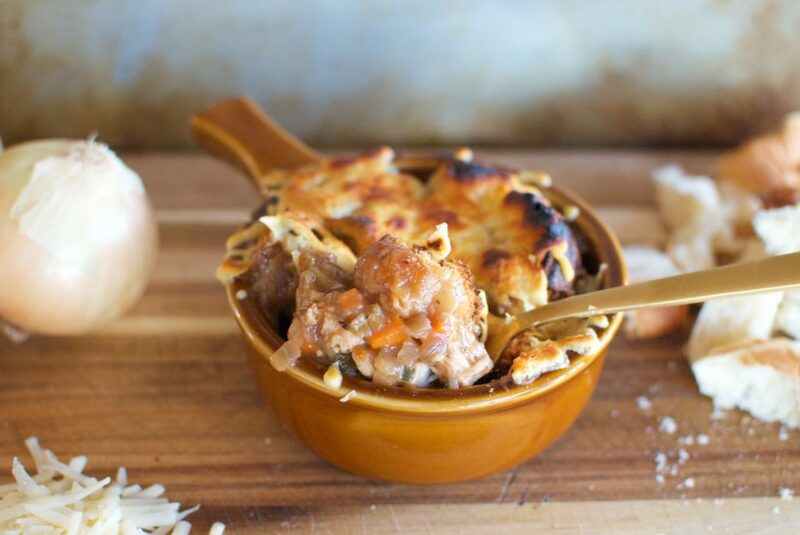 When ready to serve, ladle soup into oven proof crocks, and top with bread cubes + shredded gruyere cheese. Broil until melty, and golden brown. Serve immediately (be careful, it is VERY hot!). 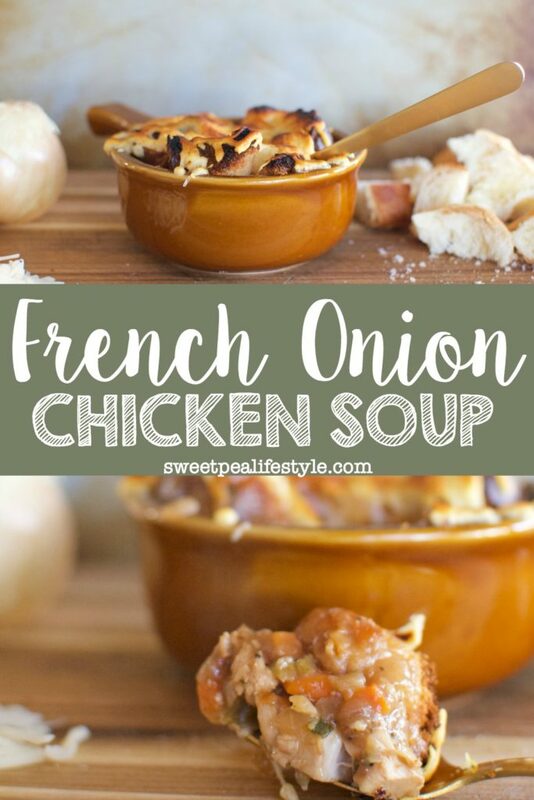 Save this graphic to your favorite soup board on Pinterest! « Five Tips for Better Sleep TONIGHT! 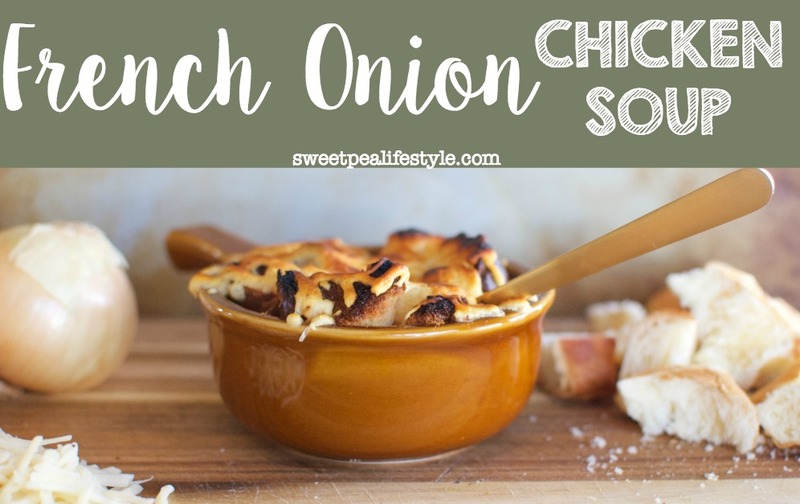 Thank you for linking up at #OvertheMoon Link Party and sharing this twist on an old favourite recipe. Have a great week!